BE COURAGEOUS, GO TO CONFESSION! Pope Francis encouraged the pilgrims filling St. Peter’s Square to receive the sacrament of reconciliation. The words he used on that day are applicable to all of us, every day. Perhaps it has been a while since you were last at confession, or perhaps you can’t remember how to go about it? Don’t worry. Just go to confession and explain your situation to the priest. 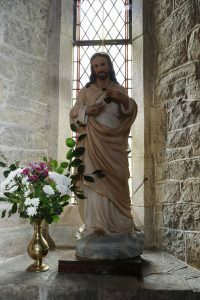 Confessions are heard in Rathdrum parish church at 7.00 p.m. on Saturday evening. In Clara Vale and Greenane, confessions can be heard by prior arrangement with the priest. Everyone say to himself: ‘When was the last time I went to confession?’ And if it has been a long time, don’t lose another day! Go, the priest will be good. And Jesus, (will be) there, and Jesus is better than the priests – Jesus receives you. He will receive you with so much love! Be courageous, and go to confession, urged the Pope on Feb. 19. Acknowledging a popular objection to the sacrament, Pope Francis noted, someone can say, ‘I confess my sins only to God.’ Yes, you can say to God, ‘forgive me,’ and say your sins. But our sins are also against our brothers, against the Church. This is is why it is necessary to ask forgiveness of the Church and of our brothers, in the person of the priest. While the celebration of the sacrament is personal, it is rooted in the universality of the Church, which accompanies us on the path of conversion, he explained. Forgiveness is not something we can give ourselves, cautioned the Pope. One asks forgiveness, one asks it of another person, and in confession, we ask forgiveness from Jesus. Forgiveness is not a result of our efforts, but is a gift. It is a gift of the Holy Spirit who showers us with mercy and grace that pours forth unceasingly from the open heart of Christ crucified and risen. The Pontiff went on to recognise that many people feel ashamed at the idea of confessing their sins and might say, “but Father, I am embarrassed!” Even embarrassment is good. It’s healthy to have a bit of shame… it does us good, because it makes us more humble. Don’t be afraid of confession, Pope Francis stressed. When someone is in line for confession he feels all these things – even shame – but then, when he finishes confessing, he leaves (feeling) free, great, beautiful, forgiven, clean, happy. The sacrament of reconciliation is a sacrament of healing, he pointed out. When I go to confession, it’s for healing: healing the soul, healing the heart because of something that I did to make it unwell. The Pope pointed to the biblical story of Jesus healing a paralysed man, which expresses the profound link between forgiveness and healing, since the Lord Jesus is revealed at the same time as the physician of soul and body. But I say to you, he stressed to the many pilgrims, every time we go to confession, God embraces us.